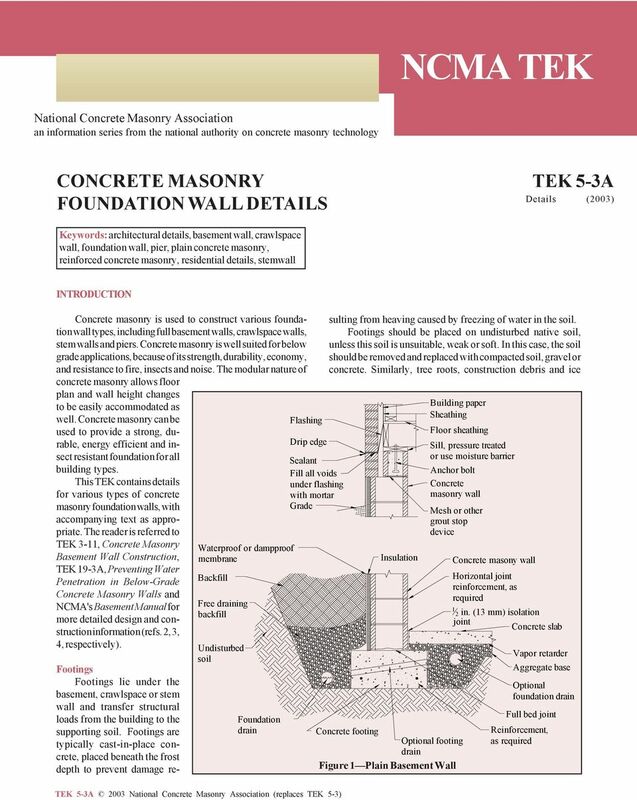 Download "NCMA TEK CONCRETE MASONRY FOUNDATION WALL DETAILS. TEK 5-3A Details (2003)"
3 Vertical reinforcement, Horizontal joint reinforcement, as required wall Continuous band joist or blocking, pressure treated or use moisture barrier Floor joist Reinforced bond beam, Sill, pressure treated or use moisture barrier Termite shield required when no bond beam is provided below sill minimum 12 in. grade or below frost line, whichever is stem wall Install for water removal if not higher than adjacent exterior grade for majority of perimeter Figure 3 Crawlspace Stemwall with Masonry Above floor, exposed pipes and ducts are typically insulated. If unvented, either the walls or the floor above can be insulated. Unvented crawlspaces must have a floor covering to minimize moisture and, where applicable, soil gas entry. A vapor retarder (typically 6-mil (0.15 mm) polyethylene, PVC or equivalent) is good practice to minimize water migration and soil gas infiltration. A 2 1 /2 in. (64 mm) concrete mud slab is generally used when a more durable surface is desired for access to utilities. A thicker concrete slab may be desirable, particularly if the crawlspace will be used for storage. A dampproof coating on the exterior crawlspace wall will also help prevent water entry into the crawlspace. STEMWALLS FOR SLAB ON GRADE A stemwall with slab on gradesupports the wall above and often also provides a brick ledge to support an exterior masonry veneer. 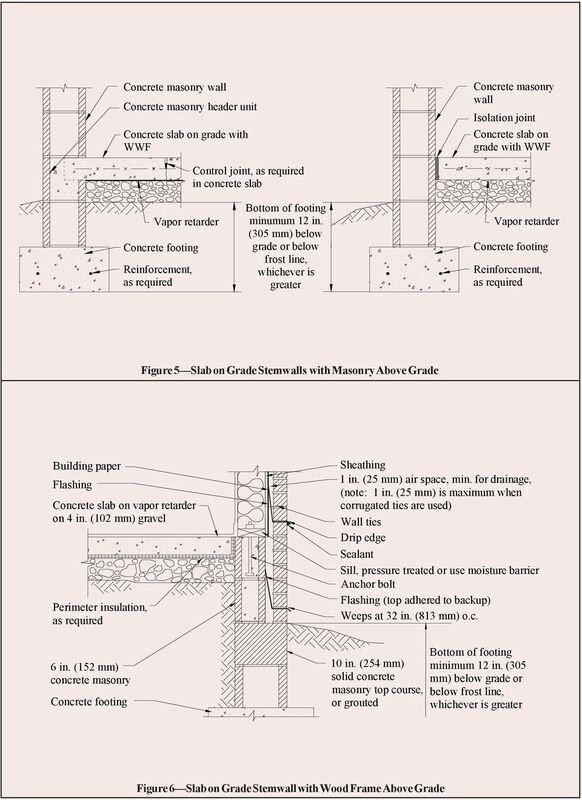 Figures 5 and 6 show concrete masonry stemwalls with masonry and with frame above grade walls, respectively. Because the wall is exposed to soil on both sides, waterproofing or dampproofing coatings are generally not required. Stemwalls are typically insulated on the exterior of the masonry. If insulated on the interior, it is important to place insulation in the joint between the slab edge and the foundation wall to avoid thermal bridging. A stemwall with brick ledge is shown in Figure 6. For this case, note that masonry design codes typically require a minimum 1 in. (25 mm) clear air space between the masonry and backup to ensure an open age cavity. A 1 in. (25 mm) air space is considered appropriate if special precautions are taken to keep the air space clean (such as by beveling the mortar bed away from the cavity or by drawing a piece of wood up the cavity to collect mortar droppings). Otherwise, a 2 in. (51 mm) air space is preferred. FOUNDATION PIERS Foundation piers (see Figure 7) are isolated structural elements used to support the building above. Structural design ensures the piers are sized and spaced to carry the necessary building loads. Piers typically are in enclosed crawlspaces, so recommendations for moisture and soil gas resistance for crawlspaces should be followed for piers as well. 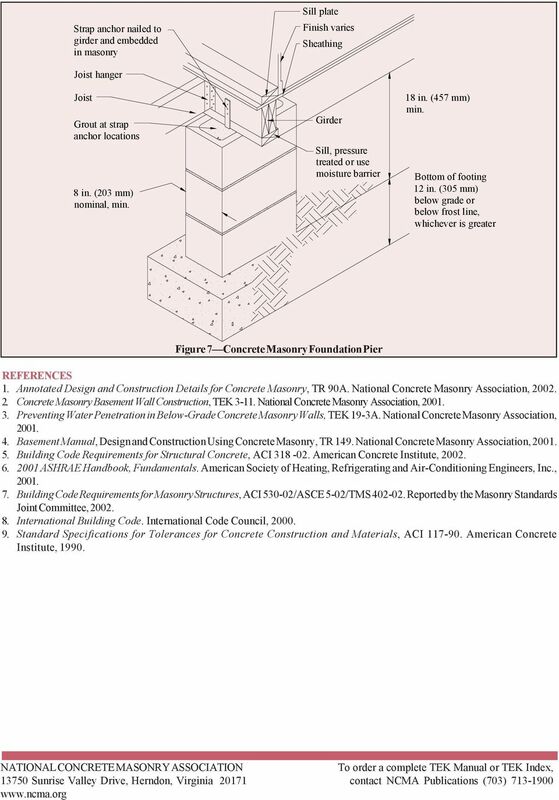 Building Code Requirements for Masonry Structures (ref. 7) requires a foundation pier to have a minimum nominal thickness of 8 in. (203 mm), with a nominal height not exceeding four times its nominal thickness and a nominal length not exceeding three times its nominal thickness. Note that the International Building Code, (ref. 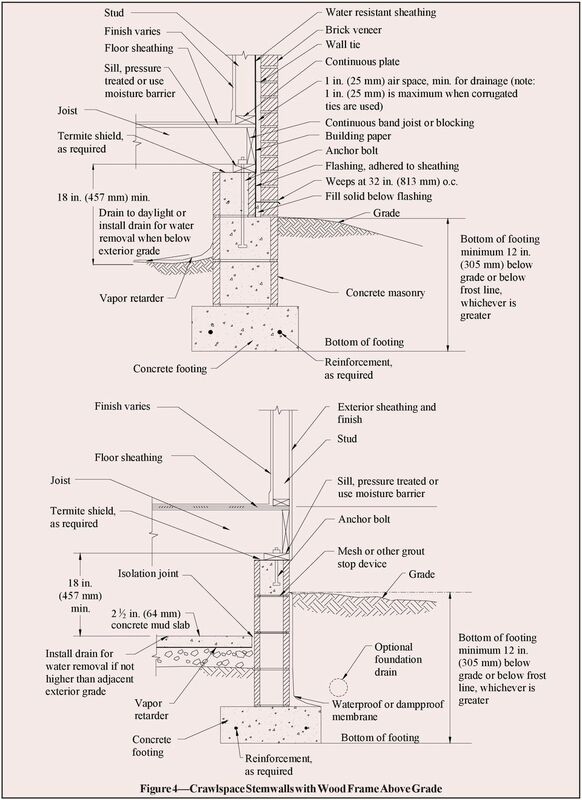 8) allows foundation piers to have a nominal height up to ten times the nominal thickness if the pier is solidly grouted, or four times the nominal thickness if it is not solidly grouted. 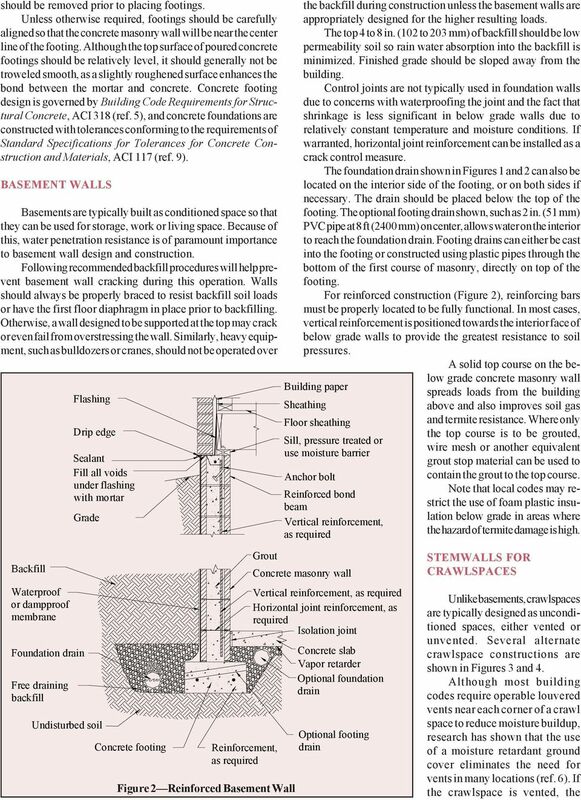 Below Grade/Walk Out Wall Designs Paul Ellringer PE, CIH Air Tamarack, Inc. March 2013 Below Grade Wall Designs Outlined in Figure 21 are the preferred ways of insulating below grade walls/ walkout walls. ICC-ES Evaluation Report Reissued July 1, 2009 This report is subject to re-examination in two years. 2014 British Columbia Building Code Changes A City of Kelowna interpretation of the 2014 Building Code Changes for 9.36 & 9.32 The following changes reflect the most notable revisions and staff interpretations. 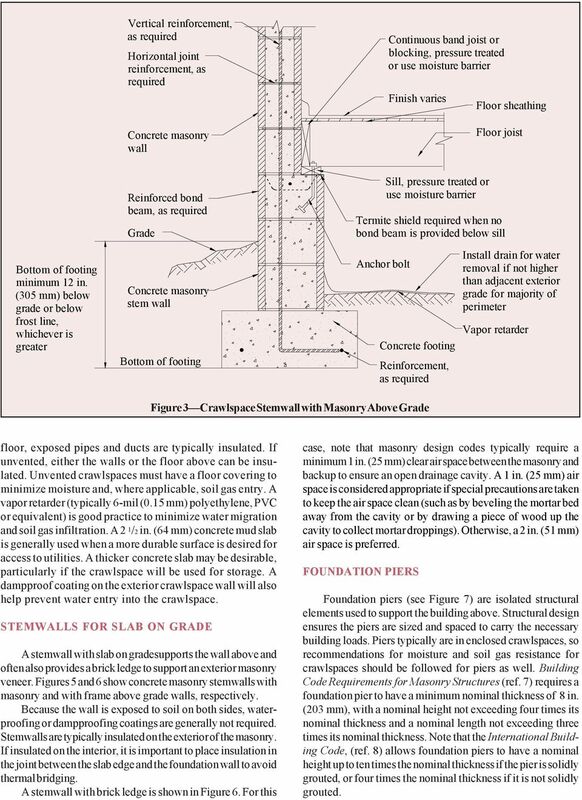 FOUNDATIONS STEPS TO CONSTRUCTING A MOISTURE-RESISTANT FOUNDATION Build a Better Home Details are critical when constructing a sound building foundation that will withstand water and control dampness. Section 5.0. Basements. Wall insulated externally. Wall insulated internally. Ba02. Product: Polyfoam ECO Floorboard Ba01. Basement Repair Services. Check your basement for Water Stains, Cracks and Bad Odors. RADON HOT SHEET. (Main) 763-251-2971 / (Fax) 763-263-0133.